It is easy to despair of the low quality of public debate on drugs policy in the UK. Some of the loudest voices in the debate reflect fixed views and make opportunistic use of any fragment of evidence that happens to support those views. The very act of contemplating certain policy options can attract vehement criticism and – consequently perhaps – some policy-makers who, before entering government, had open minds on options for drugs policy, cling firmly to the prohibitionist line when in power. Few participants in the public debate on drugs policy are prepared to consider the full range of issues involved in policy choice, or acknowledge the large uncertainties that exist in the research evidence. The debate is often conducted in emotive terms, using vague conceptions of ‘tough’ and ‘liberal’ policy, sometimes making large deductive leaps that have little backing in logic. Cannabis is the most widely used illicit drug in Britain (our research covers England and Wales). Although its use has been in slow decline for over a decade, analysis of survey evidence still suggests that there may be as many as 3.4m users (down from 5.5m in 2006), which exceeds the prevalence of all other illegal drugs combined. I see nothing in these findings to frighten any government – there is no “killer fact” that makes legalisation unthinkable. Our recent report co-authored with Mark Bryan and Emilia Del Bono sets out the basis for a comprehensive and reasoned consideration of one radical policy option – a system of licensed, regulated and taxed cannabis supply. We identify no fewer than seventeen possible consequences that need to be evaluated before arriving at an informed and balanced view on the case for this reform. They include: savings in various policing and criminal justice costs; changes in cannabis-related crime, accidents, dependency, mental and physical illness, productivity, and the scarring effects of a criminal record. The tools of cost-benefit analysis can be used to put all projected consequences of reform – both monetary and non-monetary – on a common cash-equivalent basis, giving a coherent overall view of the arguments and some idea of which particular consequences might be crucial in tilting the argument one way or the other. We evaluate only the effect of the reform on the social costs imposed by cannabis users on the rest of society, and are able to make estimates of the net social benefits or costs of reform for 13 of the 17 items on our list of possible consequences. There are large uncertainties in evaluating the costs and benefits of reform. The first is what a legalised market would look like. US models of legalisation lead to large numbers of suppliers and product heterogeneity that is hard to regulate. Other models, like the extreme case of a government monopoly proposed for Uruguay, entail fewer, larger licensed suppliers operating under tight product controls. 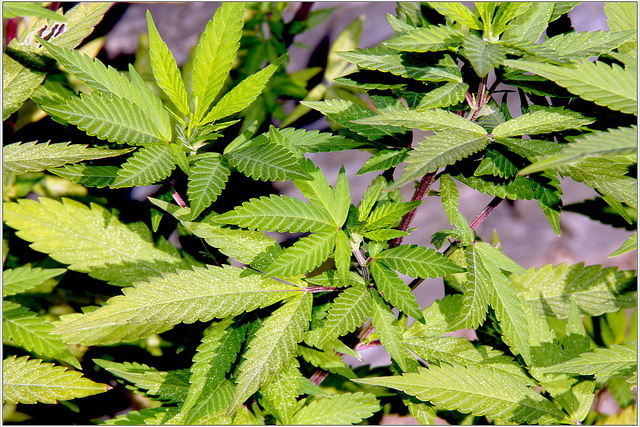 The possibility of product regulation is one of the strongest arguments for legalisation. The tobacco market currently has controls on tar, nicotine and carbon monoxide content, and similar controls could be envisaged for a regulated cannabis market. The primary psychoactive component of cannabis is D9-tetrahydrocannabinol (THC), which has been linked to impaired brain function and psychotic symptoms, but research suggests that another component, cannabidiol (CBD) has a protective anti-psychotic effect. In the last decade or so, there has been a worrying rise in the market share of high-THC, low-CBD forms of cannabis (“skunk”, etc). Analysis of cannabis samples seized by enforcement agencies around the year 2000 suggested a market share of around 15% for the most potent “sinsemilla” forms of cannabis, while the share in seizures at the end of the decade was as high 80 per cent. Figure 2 shows the results of chemical analysis of samples seized in 2008. 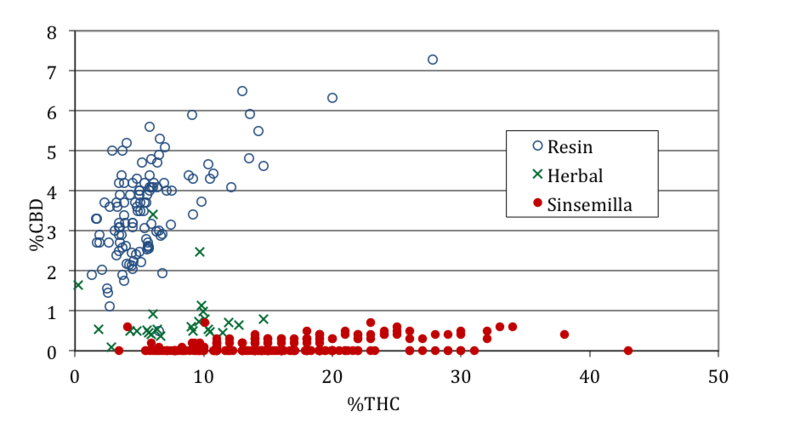 The potent sinsemilla varieties contained 16% THC on average – around double that of traditional imported herb or resin. Equally alarming, the protective CBD content of these seized samples was close to zero. It has proved impossible to control this trend towards more harmful forms of the drug under prohibitionist policy, and we are currently seeing similar problems with the emergence of more dangerous forms of ecstasy-like synthetic drugs, too. A second major source of uncertainty is the nature of demand. It has not proved possible to arrive at a clear understanding of the reasons for the slow decline in cannabis use or the shift towards higher-potency product, nor is there any research consensus on price effects, especially the cross-effects of variation in cannabis prices on the demand for alcohol, tobacco and other drugs. A third difficulty is in identifying the true causal relationship between cannabis use and eventual long-term harms. Given these uncertainties, we consider three scenarios based on alternative assumptions about the responsiveness of cannabis demand to legalisation, and also give a subjective margin of uncertainty for each estimate. Figure 3 summarises the results. We assume a significant degree of product regulation, with government setting excise taxes at a rate comparable with those used in the alcohol and tobacco markets, but the continued existence of residual illegal supply with a market share rather larger than the share of illegal supply in the tobacco market at present. The striking feature of these estimates is how small the projected costs and benefits are. This is partly because we are only considering external costs and benefits, arguing that the anticipated private costs (e.g. health risk) to cannabis users are necessarily outweighed by the anticipated enjoyment of consumption. But it is also partly because the plausible scale of cost savings (reduced enforcement costs, etc) and cost increases (medical care, crime victimisation, etc) to society appear to be inherently modest. There is no compelling evidence for a huge impact – either good or bad – on the rest of society from the changes in cannabis use likely to be produced by legalisation. A possible exception to this is cannabis-related crime. 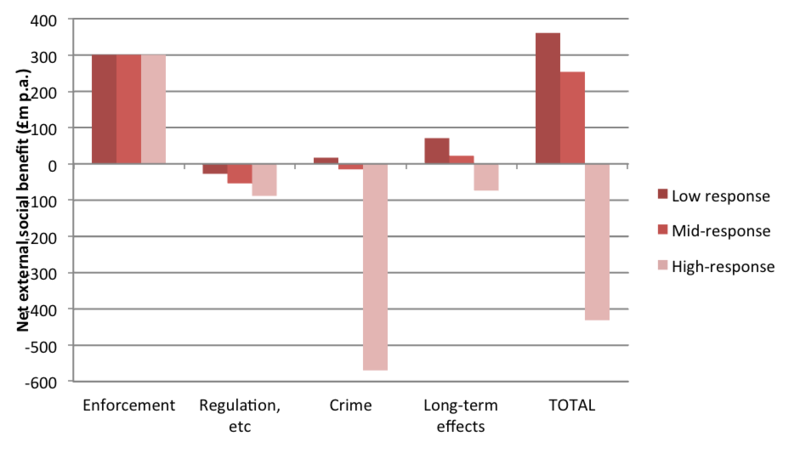 Although we find very little evidence that cannabis use causes any crime at all, the large size of the market means that costs could be high under the most pessimistic “high response” scenario. But the large projected net increase in cannabis-related crime in that case (almost £600m) is highly uncertain, with a margin of error of plus or minus £800m. 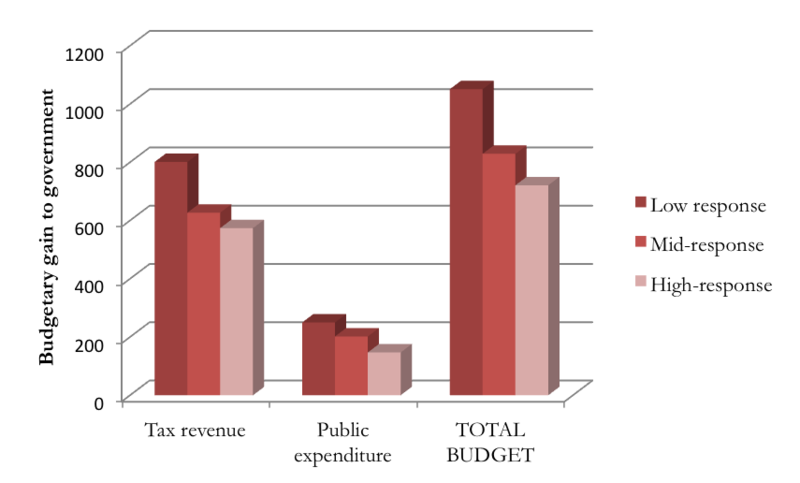 By far the largest projected impact relates to the government budget (Figure 4). Under this reform, government would gain additional tax revenue from licensed supply and make net savings on policing and criminal justice costs. Since taxes represent transfers within society rather than gains to society, the improvement in the government’s budgetary position is not a strong argument for reform in principle, but it might be an attractive feature of reform to governments in practice. I see nothing in these findings to frighten any government – there is no “killer fact” that makes legalisation unthinkable. While there is a significant possibility of net social harm if the demand response to policy change turned out to be extremely high, close monitoring of prevalence would allow the policy to be evaluated in practice and reversed if necessary. If we have learned anything from British drugs policy in the last decade or so, it is that abrupt reversals of liberal policy initiatives are always possible. Stephen Pudney is Professor of Economics at the Institute for Social and Economic Research at the University of Essex. Professor Pudney is grateful to the Open Society Institute (OSI-ZUG) and UK Economic and Social Research Council through the Research Centre on Micro-Social Change (award no. RES-518-285-001) for supporting this research. The research reported here all relates to England and Wales rather than Great Britain or the UK. Ending prohibition makes financial sense, it costs too much to enforce and even more to keep people locked up for taking prohibited substances. As for the dealers, it costs just as much if not more to deal with them, do why not have them compete with legitimate taxpaying businesses? Dealers tend to sell low quality products, for example they add sand or glass to the plant to add weight, if it was legal they’d leave themselves open to litigation from those who continue to buy from them and if they sell without proper licences and pay vat like anyone else instead of being guests at public expense (locked up) they should be fined heavily & hounded till they pay up. Prohibition only serves to satisfy the prohibitionists at the expense of everyone else, how selfish! !